Dan Harshberger, left, and Dan Stutley keep debris from backing up near Tripp Creek at County Road 203 on Friday afternoon. A flash flood warning was issued for the 416 Fire burn scar, but rain fell too far west to cause damage. 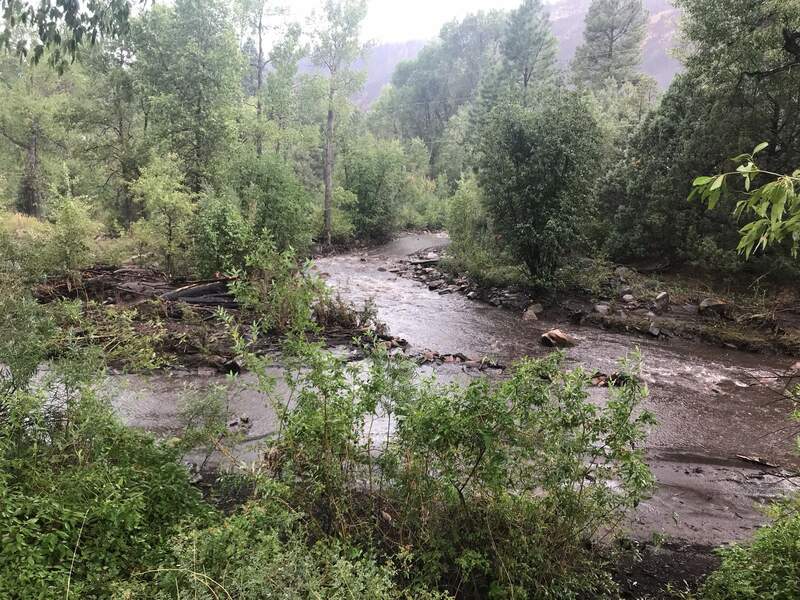 A flash-flood warning was issued Friday for the 416 Fire burn scar, but storms triggered only limited mud flows across County Road 203. Southwest Colorado may see some isolated thunderstorms this weekend. 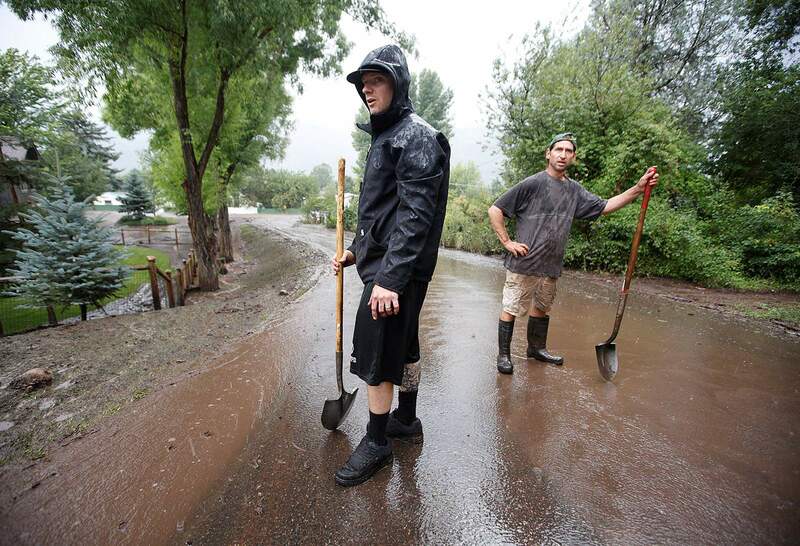 However, the chance for rain strong enough to trigger a flash-flood warning like the one that had emergency officials scrambling Friday afternoon is unlikely, said Dan Cuevas, a technician with the National Weather Service in Grand Junction. Cuevas said Durango is looking at a 20 percent chance of rain Saturday, a 20 percent chance Saturday night and a 10 percent chance Sunday. Sunday night should be clear. In the north Animas Valley, the chance of rain Saturday is 30 percent, with a 20 percent chance Saturday night. Sunday holds a 20 percent chance of rain for the area. “Afternoon clouds could still build up, and you might have some isolated thunderstorms in the Animas Valley and Durango, but things should be drying out for the most part early next week,” he said. 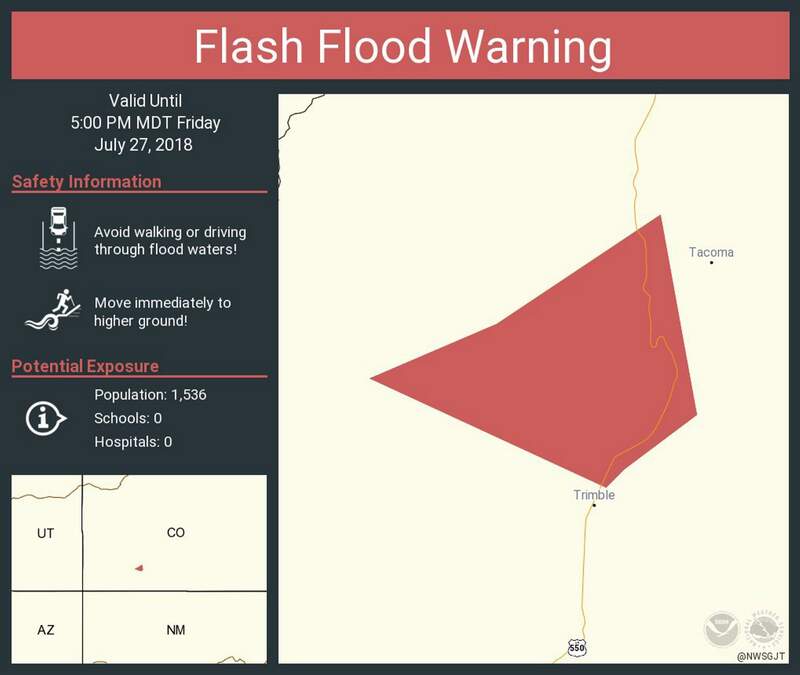 A flash-flood warning was issued early Friday and extended to 5 p.m. for the 416 Fire burn scar, but it expired with only limited mud flows across County Road 203, said Megan Stackhouse, a meteorologist with the Weather Service in Grand Junction. “The storm has to set up in the right place,” for heavy flooding and debris flows to ensue, Stackhouse said. “Most of the heavy rain from this storm fell a little too far west,” she said. The heavy rains Tuesday, she added, fell right over the burn scar. “This is definitely still going to be a problem, and it will be for several years, but the cell has to hit right, and then everything flows from that,” she said.